Artisan's Battery-electric 4 tonne LHD. More powerful, more productive, and more cost-cutting. Powered by Lithium batteries and an extremely power dense electric motor system, the A4 not only reduces ventilation and cooling expense for mining companies, but also outperforms diesel LHDs. The A4 produces 300% of the horsepower of 4 tonne diesel machines. With 30% more load per bucket, It loads quicker. It hauls up steep grades faster, and is far more precise and responsive to operator commands. Battery power positively improves all of a mine’s core measurements. Safer, More Reliable, and More Productive than Diesel. The electric powertrain and battery technology behind the A4 has been operating in underground mines for nearly a decade. Over the last several years the A4 has proven to be the best 4 tonne LHD for increasing production, mine efficiency, and improving working environments for underground workers. Increased visibility, better maneuverability, and more. The A4 loads quicker, hauls up steep grades faster, and is more precise and responsive to operator commands. Operators prefer our battery powered units over diesel because of their higher productivity, more tons moved per shift, zero poisonous diesel emissions, extremely low heat, and quiet operation. 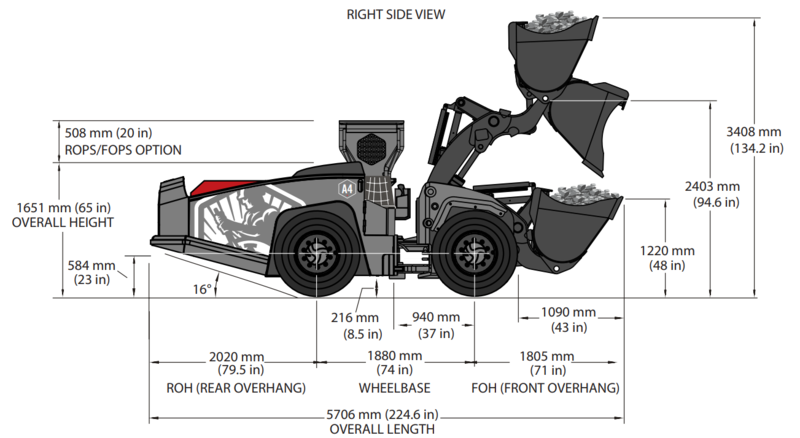 The A4 is a battery powered 2yd, 4 tonne Load/Haul/Dump (LHD) underground mining vehicle. Powered by Lithium batteries and an extremely power dense electric motor system, the A4 not only reduces ventilation and cooling expense for mining companies, but also outperforms the diesel competition. Move more tons per hour, reduce cost per ton, provide a healthier environment, and improve job satisfaction.